The trenchless and dig free process can usually be done in a day and it is minimally invasive. However, there are a few things that you need to know will happen after the process is complete. 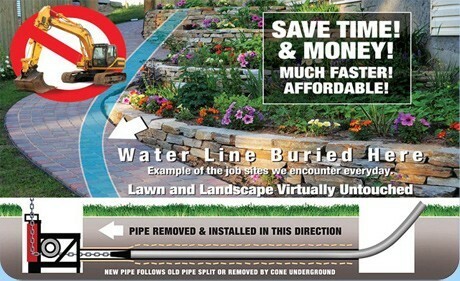 Call the Warminster trenchless sewer and water line replacement professionals at Resolve Rooter Trenchless today. Our expert plumbers have years of experience working with countless customers helping them replace their water and sewer lines. We’re available 24/7 for emergency plumbing services in case something happens after hours. Is Cement and Asphalt Covered in No Dig Technology? Cement and asphalt removal can be a challenging task, along with possible safety hazards if it is not handled by the trained Warminster trenchless sewer and water line professionals at Resolve Trenchless. The replacement of public cement or asphalt, like sidewalks or areas considered township easements, is included in your contract. However, cement and asphalt on your property, like patios or driveways, are usually not covered. Sometimes during the trenchless sewer and water line replacement process our plumbers will have to dig up patches of asphalt or cement. Afterwards, we’ll replace what we’ve removed. Something that many homeowners don’t expect is that the new patches will look different than the original cement or asphalt. Over time, your cement and asphalt has had a chance to absorb dirt and age. It will take some time for the new cement to dry, expand and become the same color as the rest. While trenchless sewer and water line replacement usually only requires us to dig a couple of holes in your yard, we still will replace that dirt. Like cement and asphalt, soil removal or replacement of excess soil is usually not covered in your contract. If you are interested in this service please speak with our technicians about it and ensure that it is specified in your contract. Your ground has been settling for many years and has released much of the air from the soil causing it to become very compact. When we dig up that dirt and replace it, we will allow air to re–enter the soil which can often cause a slight mound. We recommend that our customers wait several weeks (longer if there is no rain) to allow for the air pockets air to seep out. Our technicians will do their absolute best to minimize excess dirt to facilitate raking and seeding the evacuated area. Another issue that can arise is an indentation or depression in the ground. This is normally caused when your soil is saturated with water which is often caused by a waterline leak. The water turns the dirt into mud which allows the water to escape into the bedrock or along the surface when the dirt is removed. We recommend that you allow the ground to settle and dry for approximately 2 weeks and then add more soil. By letting the soil settle first you can prevent having to return several times to continually add soil. Our technicians will ensure that the excavation site is properly secured for safety with caution tape and wood while the settling occurs. 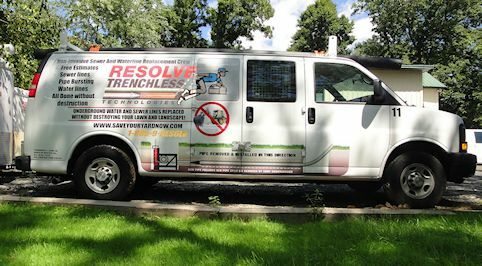 The trenchless and dig free sewer and water line replacement professionals at Resolve Trenchless have years of experience working on countless projects. We can walk you through the entire process. We’re available 24/7 and no matter where you are Resolve Trenchless is right around the corner with a technician ready.